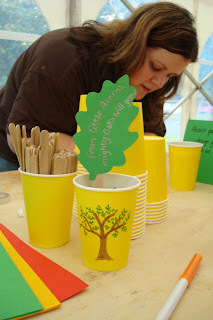 A deliberative space for our new politics? 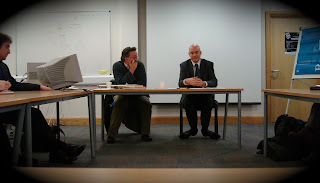 Mick Fealty, the brains behind the creation of Slugger O’Toole, was over from foggy Dorset to talk alongside Ciarán O’Kelly about how online communication can contribute to political debate, and whether it helps it take a different shape from old(er) fashioned engagement between politicians and the politically interested. there was some good stuff. Accessible too! But the internet doesn’t charge by the electron. It’s not in a hurry. In a blog or a forum, there’s plenty of space to come back to this morning’s post and add another response, never mind returning to yesterday’s thread or last month’s debate. Northern Ireland’s early online political debate started out in places like Vincent Hanna’s Compuserve forums. But bulletin boards were (and still are) a cacophony of voices, randomly starting topics, interjecting and swerving off-topic mid-thread. Blog posts tend to be dominated by a single voice, a consistent set of values and personal background that command what’s written “above the line” in the main post. Blogs differentiate themselves by their voice. And while there is still a melee of commenters “below the line” (in popular blogs anyway), it’s centred around a sophisticated starting point in the original post. 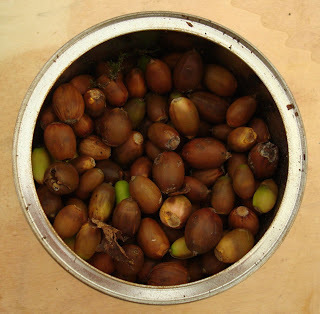 And with discipline - and an eye for libel - the commenting can be proactively gardened ing, pruning the straggly branches, and removing the poisonous weeds. A final thought before I retire to the third episode of Spooks ... as politicians, political parties, governments and other big institutions and corporations start to use the web to garner opinion and test out lines and policies, they need to remember not to be overwhelmed by the choir of discordant voices. Those politicians, governments and organisations are the ones with the executive responsibility (and sometimes mandates and /or salaries) to make decisions, to listen and to pick out a course. They don’t have to guarantee every contributor a slice of the end vision (or a sentence in the consultation response). As my head settled on the pillow, it was one of the last questions I expected to be asked. When historians and commentators look back on life in Northern Ireland in twenty or fifty years time, what will they remark on? What will they draw attention to and criticise? Today, people would look back and comment on the sectarianism and violence of the past thirty or more years that has so cruelly hurt our current society, and shaped the political playing field that now occupies our MLAs up at Stormont. But what is there in today’s society that will stand out like a sore and irritating thumb in twenty, thirty or fifty years time? It’s a bit more serious than the usual AIB post, but why not? Leave your ideas as comments, and I’ll come back to this topic in a week or so. My starter for ten would centre around our lack of respect, fear and reaction to newcomers (even second or third generation ones) and outsiders. Western society stands against slavery and sweat shops, but are we consistent in our welcome to and treatment of immigrants and foreign workers within our own shores? Without wanting to labour the point, here’s a few examples to back up my observation. Have we not created a class of jobs in Northern Ireland that “locals would never do”. While newspapers like the Belfast Telegraph have been sold from pull-along stands on Belfast street corners since well before I was born, eastern European men seem to be the only ones willing to work as roadside distributors, standing at traffic lights in all weather to sell papers to queueing motorists for minimal reward. The Chinese community have a long and successful association with Belfast. Aside from running many fine Chinese takeaways and restaurants, generations have settled into local life, schools and culture, using their skills and talent to successfully move beyond catering and hospitality into other areas of the community too. Even politics! (Topical this week!) But as NI’s religious tensions wane ever so slightly, the Chinese community’s success seems to have marked them out as a target for racism and intimidation. Take the struggle over the last three or more years to get plans approved and local support in place to build a Chinese community centre in the Donegal Pass area ... despite having jumped through the big hurdle of securing Lottery funding. Instead, leaflets were distributed claiming that the Chinese community “undermines the [Donegal Pass] community’s Britishness”. It might be a tiny minority standing in their way, but it’s still wrong. 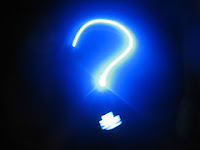 While all of these situations are more complicated that the one (two?) dimensional explanation that I’m summarising in this post, there’s an injustice and a lack of grace about them. A lack of empathy with our neighbour. They feel like examples of our society’s fear of change, and fear of foreign ideas and people. Is it an insecurity? Is it a bizarre attempt to avoid being politically incorrect? Is is an unconscious distrust? Is it racism? 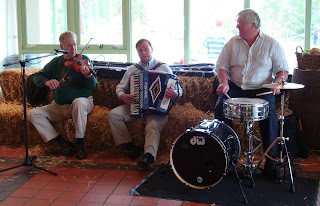 The local blogosphere deserves a mention too. Without wanting to stir up more controversy that I can chew, some of David Vance’s posts (and the subsequent comments) over at A Tangled Web disturb me. It’s as if it’s ok to always assume the worst. To assume guilt rather than innocence. To believe the stereotype rather than seeking to get to know the individual underneath. Where’s the grace in the post Jailed for being black (discussing the Frank Kakopa case and the Equality Commission’s intervention). Or take the post Well done Dulles Airport which first congratulates the Department of Homeland Security operatives’ decision to search and detain Shahid Malik MP, Britain’s first Muslim minister (incidentally, he’s International Development Minster in case you thought he was Minister for Muslims) for 40 minutes at the airport (not just the cursory “can I check your backpack?” I regularly get caught with at Belfast City) as he travelled home from a counter-terrorism meeting in Washington DC with the very same Department of Homeland Security. The post then goes on to appeal for an end to random searching, and to focus solely on Muslims and to ignore “elderly women, young mothers, even Nuns” (presumably unless they’re Muslim grannies, mothers and nuns). On that basis, I conjecture the commentators (and perhaps even bloggers if such time-wasting continues long into the future) will look back on us with dismay and disappointment. Comments welcomed, along with other suggestions for areas that will be tut tutted about in twenty or so years time. Who ya callin’ a Muppet? Having seen Avenue Q (a puppet musical that’s still running in London - go and see it if you’re over), puppeteers really make or break a show. 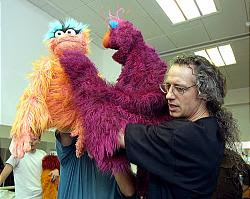 The home five will work alongside Marty Robinson who according to the Muppet Wiki joined The Jim Henson Company back in 1980 as the man behind Aloysius Snuffleupagus, Telly Monster, Slimey the Worm, and has helped to hire and train puppeteers in Sesame offshoots in Mexico, Israel, Palestine, Egypt, Russia and Bangladesh. So he’s no stranger to conflict! It’s proving great fodder for local newspapers who are responding to the drip, drip of news from production company Sixteen South by printing fortnightly stories. It’s sure to become cult viewing - certainly amongst the student population who forty years ago tuned into The Magic Roundabout at 5.40pm each evening before the early evening news. Word has even spread to the Indian TV portal Televisionpoint.com. So who will we see? Potto is the big purple character, “gentle, bookish and a brilliant inventor”. Assisted by Hilda (a younger and more energetic hare with pink guddies gutties), the pair will answer the questions posed by Northern Ireland children to the Sesame Tree each week. 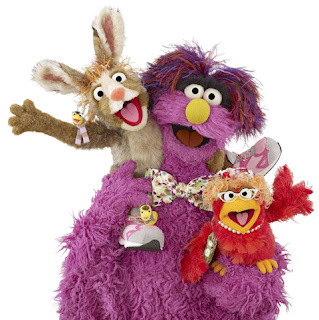 The supporting cast includes the Bookworms (two helpful and friendly worm-Muppets who live among Potto's books), Claribelle (“a bright, loveable and eccentric auntie character who occasionally visits the tree”) and the three Weatherberries (Muppet fruit - that hang together in a bunch inside the Sesame Tree). And if that’s not enough, every now and again Potto will get in touch with his family back in the US, introducing some of the well known global characters like Bert and Ernie, Elmo and Cookie Monster. If you’re wanting to get into the mood, check out the weekly US Sesame Street podcast (RSS or iTunes). The kitsch countdown continues … with only 45 days to go (at time of posting) to the opening of the Belfast IKEA on 13 December. The store (disappointedly not itself flat-packed) has been constructed fairly quickly over the last six months or so, and progress has been quite visible while coming into last at Belfast City Airport (or driving into Secret Sainsburys). 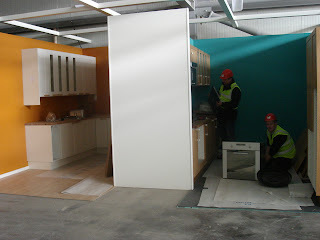 The IKEA site has started a Manager’s blog with some details about progress and pictures of show kitchens being constructed. While part of me wants to disassociate myself from the inevitable hype and traffic jams that will form part of the store’s opening - I’ve lived without IKEA for thirty something years, so what’s going to change? - there is part of me looking forward to exciting adventures exploring the vast showroom with a scampering three year old! I picked up a DVD of The Page Turner (La Tourneuse de Pages) a couple of weeks ago, and now that The West Wing is out of the way (having started last Christmas, we’ve finally made our way through all seven series) we settled down on Saturday night to an evening of piano music and tension. 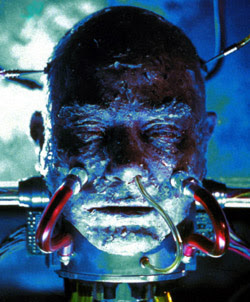 Eleven months after first seeing it in the cinema, the film’s so much more menacing the second time through. On repeat viewing, so many of Mélanie’s (Déborah François) actions and words point to her planning revenge, even leaving us wondering if she’d been involved in Ariane’s (Catherine Frot) car crash? Anyway, an excellent film, well worth viewing (or hiring). Interestingly, my original review post continues to receive a lot of hits from Google - mostly from people searching for the French title “la tourneuse de pages” rather than the English “the page turner”. I was also shocked to discover that last week’s post mentioning the fun children’s book “Aliens Love Underpants” has a ridiculously high page ranking (below Amazon, but above Waterstones), and that the post written following the night of the death of David Ervine strangely still sits below his Wikipedia entry, and above the BBC News article announcing his death. Remember back in 1995, every Friday night served up another helping of PK Tonight, with Patrick Kielty's close-to-the-knuckle jokes, guests and bands. Spinning the Big Rickety Wheel was a constant segment throughout the series. 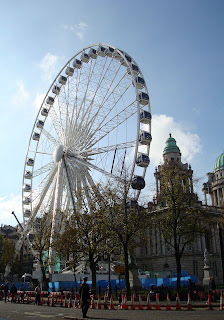 And now Belfast has built a replica - between a quarter and half the size of the London Eye, and strictly a temporary structure that last a few months at the side of Belfast City Hall. It'll take fifteen minutes to complete a revolution. One of the capsules is black and marked VIP ... not sure what advantage it offers. 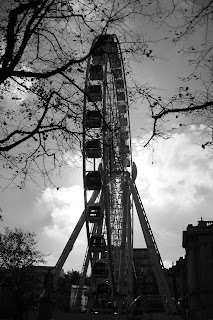 But it'll surely become a lunchtime treat - depending on the cost (the wheel is supposed to be self-financing over the few months it remains in Belfast). 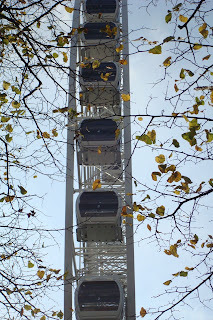 A bit like the St Anne's Cathedral spire, the wheel pops up in all kinds of views across Belfast: appearing between city centre buildings, peeping above the rooftops as you drive across the Albert Bridge and up past Central Station. Coming to Belfast may get you into trouble with a judge! While Belfast City Council are keen to attract tourists to Belfast (see the earlier posting about yourviewsonbelfast.com), they may not have expected to hold up trials in the process! The Register publishes a story (via the Herald Express) about a case in Exeter Crown Court that has been delayed when a key witness got fed up waiting around for the trial to begin and hopped on a plane over to Belfast. It’s a conspiracy to defraud case centred around a man who is alleged to have put relatively low value goods - computer games, DVDs and perfumes - up for auction on eBay, and then cashed the buyers’ cheques without sending the goods. Two other accused men (one from Belfast) pleaded guilty and will be sentenced in December. Judge Philip Wassall told the jury he considered ordering a plane carrying [the witness] from Exeter to Belfast to turn around while in mid air so the man, described only as an "eBay employee," could offer his testimony. The judge decided against that option after considering the inconvenience to other passengers. A witness summons has now been issued, and the witness could be ordered to pay costs for the court’s wasted time. 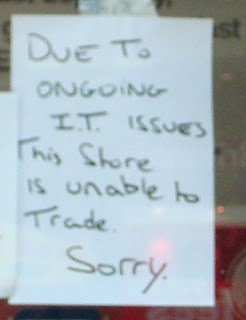 Carphone Warehouse - not trading today! 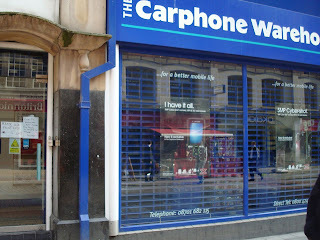 Not the best day for the Belfast branch of The Carphone Warehouse. A little short of electrons perhaps! 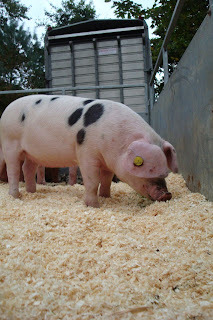 Update 2/11: And a big hello to all the folk at CPW who are reading this post this morning! Richard & Judy ... Aliens Love Underpants ... Alphaoops! In book news, Richard and Judy are spreading their commercial literary expertise to start up a children’s book club. Channel 4, tonight at 8pm (competing for your attention with Waterloo Road over on BBC1 and some football match on Five). And I’m pleased to report that the splendidly fun Aliens Love Underpants! by Claire Freedman and Ben Cort is on their initial list. Although placed in their Early (5+) category, I can confirm that it’s one of the current favourites of our just under three year old daughter. One deserving book that hasn’t made it to their list but is a joy to read (over and over and over again) is Alphaoops! The Day Z Went First by Alethea Kontis and Bob Kolar which I picked up in San Francisco airport about eleven months ago. The story of what happens when the Z decides not to go last, and the other letters mess around too. Explains why we have a ("J is for") Jack-o'-Lantern in the house, rather than a pumpkin! Update: The overnight viewing figures weren't so enthusiastic about Richard & Judy's Best Kid's Books - with only 684k viewers (2.9%) tuning in. So far this year, this slot on Channel 4 normally averages 2.3m (10.9%). But as part of C4's Lost for Words literacy season, it may have been a worthwhile public service broadcasting gesture to schedule the programme in such a lucrative slot. So Lonely Planet* think that Northern Ireland is one of the must-see countries to visit in 2007, and Belfast is one of the top ten “Cities on the Rise”. But the city council believe that if Belfast doesn’t market itself properly and positively, then there’s no reason to expect that the tourist pounds (and euros) will fill our city’s cash registers and bank accounts. Of course, before you market, you need to know what you’ve got to flog. And that’s why Lloyd Northover brand consultants have conducted hundreds of interviews across the business, hospitality, development and media communities, and have now opened up a website - yourviewsonbelfast.com - to get Northern Ireland residents’ views on their capital city. Along with the vote for the Arthur Street replacement for the old Cornmarket bandstand, you can have so much fun online now! * You might want to check out the Lonely Planet sections titled Don’t trouble yourself with Dublin, head to Belfast instead and Best pubs in Belfast to meet an ex terrorist. I noticed recently that 4oD has opened up some of the Channel 4 archive as part of its 25th anniversary celebrations. So oft remembered but never repeated dramas along with old series of Grand Designs are available to download and enjoy for free. For the discerning AiB reader who is less glued to the interweb, 4oD is Channel 4’s on-demand service that allows you to download C4, E4, Film4, AnythingElseEndingIn4 TV shows to your PC (got to be Windows XP or Vista) and watch at your leisure. In general, you’ve 30 days to watch what you’ve downloaded, and 48 hours to complete watching programmes once you start watching them for the first time. Technically, 4oD uses the same Kontiki peer-to-peer (P2P) software as BBC's iPlayer, meaning that while you have a show downloaded your PC may be used to send parts of it to other users downloading the same programme. Spreads out the bandwidth across the 4oD users and reduces the load on Channel 4’s servers ... but does have some implications if your ISP limits the uploads you make in a month. 4oD is also available as a catch-up service on Virgin Media, BT Vision and Tiscali IPTV platforms. Knowing that he was dying from pancreatic cancer, Dennis Potter wrote two four-part dramas, asking that they be co-produced by BBC and Channel 4. In 1996, nearly two years after his death, Karaoke and Cold Lazarus were aired. Karaoke told the tale of a dying writer, Daniel Feeld, and was as odd as anything Potter had previously written despite its touching parallels with Potter’s final weeks. In contrast, Cold Lazarus was quite breathtaking in its vision of the future, where Feeld’s cryogenically preserved head is leaking out its four hundred year old memories. Few who watched it will forget the RONs (Reality or Nothing) - a luddite resistance movement who want to destroy the virtual reality in which society now exists and go back to physical idealism. Being last broadcast in 1996, it probably shouldn’t surprise me that there are practically no still images from either drama available on line. Otherwise, this article might be better illustrated! While we’re on the subject of on-demand TV, it’s also been announced that iPlayer (BBC’s on-demand catch-up service) will be introducing a streamed version (using Adobe Flash) as part of the official consumer launch of iPlayer at Christmas, allowing Mac and Linux users access to iPlayer’s catalogue of shows for the first time. Nothing to stop PC users streaming either ... though I wonder if the streamed content will be poorer quality than the download service due to bandwidth and time constraints. Whereas the download service allows for convenient viewing offline on a train or plane, streaming has the downside of having to be online to watch the content (unless there’s some clever caching system). Ashley Highfield, the BBC director of future media and technology, said that there was a “cost per person reach” factor that meant that it was “too early to make the call” on when to develop a download service. Rapunzel is a German fairy tale, one that until a couple of weeks ago I hadn’t much awareness of. Sure, something about a fair young maiden in a tower letting her hair down to allow a prince to climb up to rescue her. But that was about it. Thank goodness then for Wikipedia, and the comprehensive synopsis it provided. The original tale turns out to be not quite so straightforward as my sketchy memory, with a few more twists and turns, and a sting in the tale. Not every fairy tale resolves completely and neatly. Tonight in a Belfast cinema I saw the BBC premiere of a new version of Rapunzel. It’s one of four hour-long stories - that I mentioned in a post last November - that are being given a contemporary retelling in the Fairy Tales series that hits BBC1 UK-wide over the next couple of months. All four tales were shot entirely in Northern Ireland over the summer. Rapunzel is set in the ruthless world of tennis. Lee Ingleby (who you probably last saw in Life on Mars) takes on the role of Jimmy Stojkovic, a failing tennis player with a liability of a father (played by Eastender’s Shaun Williamson). Needing more success that he was likely to get on the men’s tour, Jimmy swaps over to play tennis as a woman, complete with a fetching wig. 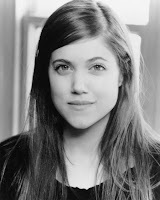 But falling in love with the beautiful long-haired Billy Jane (marketed by her mother under the brand of Rapunzel, and played by actress Charity Wakefield) complicates the deceit. Superbly written by Ed Roe, there was lots of laughter tonight as the tale of Rapunzel played out on the big screen. And given that taster, I'm definitely looking forward to the other tales - Billy Goat, Cinderella and The Emperor's New Clothes - hitting the small screen later this year. A great advert for Northern Ireland - both in terms of scenery and our ability to support the production of high-quality network drama. Hopefully it'll be a Belfast launch with a happy ending that brings more drama productions across to these shores. Game, set and match. Update: The BBC press pack is now out, with a bit more explanation about Rapunzel's plot and production, along with more details about the other three fairy stories in the series. Further update: The four-part anthology due to be aired in November/December will now be screened in the New Year. 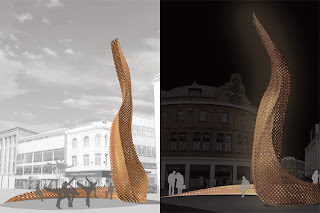 Public Art to replace the Cornmarket bandstand ... you decide! Cyberscribe and Slugger beat me to it, but it’s a public art story that’s worth repeating. Remember the Cornmarket bandstand? The landmark that took the bad look of the humorously coloured Frazer (Fraser?) Frazer’s clothes shop. The bandstand that hosted school children singing tuneful and not-so-tuneful carols in the run up to Christmas each year. And the one that the council boarded up to make it look like a big pot when they hosted cookery demonstrations inside. Well, it was pulled down a while back, and the Department of Social Development is running a public vote as part of its Streets Ahead project to let us all decide which shortlisted piece of public art should be erected in the space. Interestingly, it’s now referred to as Arthur Square, the space formerly known as Cornmarket. The Dancing Tree - five wobbly pillars, like upside-down wind chimes, representing a hollow oak tree, acting as a meeting place as well as a backdrop for occasional drama. 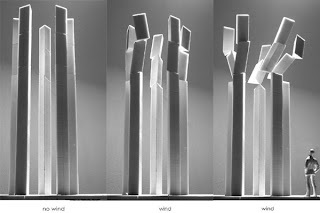 The top of the pillars will rotate and swing in the wind, and a spotlight in the pavement will “attract the flâneurs from different directions”. Phoenix Rising - a big spoon sticking out of the ground, representing Belfast’s renaissance, “a Phoenix Rising that sweeps the ground and spirals up to reach into the sky”. As a landmark and beacon, it too will support street performance, as its “oval seat becomes a perfect mini-amphitheatre”. 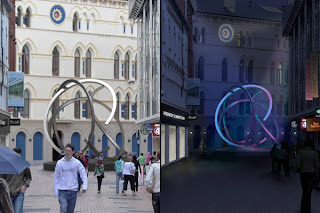 There’s £200k at stake - the budget allocated for this public art - so we better take this seriously. The online poll opened today, and runs until November 4. You can also vote in person at the Lagan Lookout (beside the Big Fish) and see the exhibition between 11am–4pm (Monday to Friday) and 11am–2pm (Saturday). Something unexpected and unexplained happened today. I got a hand addressed envelope in this morning’s mail. When I opened it, out fell a compliment slip and three free ticket passes from the Curzon Cinema chain in London that I tend to frequent when I’m over there working. No explanation, just three free tickets! So thank you Curzon Cinemas. And one good turn deserves another. If you’re ever in London and looking for a decent cinema to go and see something intelligent, can I recommend you check out the Curzon. The Renoir’s handy if you’re up near Bloomsbury, and the excellent Curzon Soho is just around the corner from Leicester Square and Yung’s in Chinatown. The post - different envelope - also brought an invitation to Drinks and Canapés on a Tuesday night in November. Think that’s the first time anyone’s ever invited me to a do by that name. 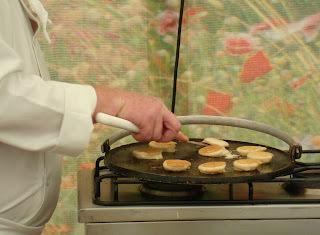 Roll on the puff pastry vol-au-vents and the dips. Getting home on time: it just wasn’t meant to be. Arriving at Heathrow in just enough time to have a chance of getting a set on the earlier 18:55 flight, but not guaranteed. Got down to Gate 2 to be told there were no seats left. In an inspired move, I intoned the name of an upgrade voucher, so were there any seats in business? Oh yes. There’s just one seat in business. And then my heart sank as I rifled through my wallet to discover that I’d used the last voucher in September, and I didn’t have one after all. 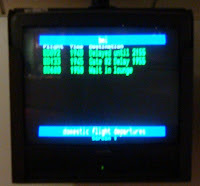 So here I am in the bmi lounge, awaiting the 19:40 flight that’s due to take off as 21:55. But I’ve got to put a good word in for bmi customer service. Realising that the departure time is not going to significantly improve, they didn’t wait the full two hours before making refreshment vouchers available. Neither did they leave it to passengers to realise that they were due something. Instead, they put their thoughtful hats on, realised that the Costa Coffee outlet that serves hot panini* etc would close before our flight took off, and started giving out vouchers (a whole £7.50) shortly after 19:30. Thank you bmi for making a bad situation better. Update: expected departure moved back to 21:15! In a result that had bookies reaching their hands deep into their pockets, Irish author Anne Enright picked up The 2007 Man Booker Prize last night with her novel The Gathering, published by Jonathon Cape. William Crawley was hoping for Animal's People (by Indra Sinha). 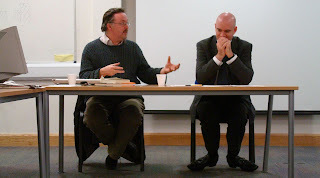 Many others reckoned that Ian McEwan’s year had finally come. I guess he’ll have to churn out another book for his publisher to enter in a future competition. As a 12/1 outsider - not to mention, as a mightly fine author to have got through to the final short list - Anne commented after winning that she was now glad she’d managed on Monday to buy a dress for Tuesday night’s ceremony. A pity that like last year the event wasn’t fully televised, other than the announcement being made during the 10 o’clock news, and an interview with the winner on Newsnight (that I caught being repeated later on News 24). Gone are the days with a husky Kirsty Wark whispering snippets of information about the short listed authors in an echoing venue. And remember that you can still read the reviews of the Booker long list (which includes the short list) over at The Asylum. 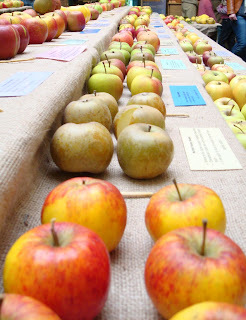 We ended up calling in at the Autumn Festival over lunchtime today. It’s on again tomorrow in Crawfordsburn Park if you fancy what you see. 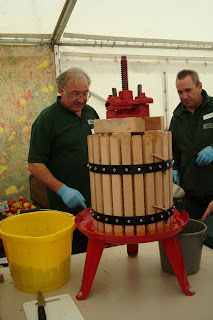 ... and pressed apple to drink. 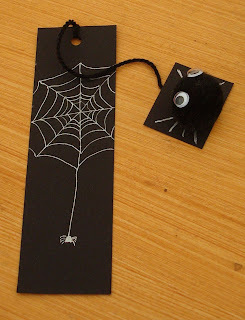 ... and making creepy spider bookmarks. 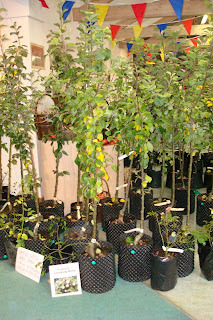 and apple trees to purchase and plant. 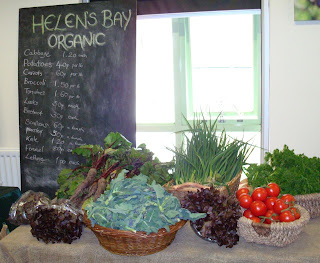 Organic fruit and vegetables on sale from Helen’s Bay Organic stall. 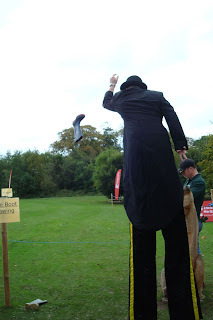 and the statutory man on stilts providing witty banter to all around and who had a distinct advantage when it came to the welly throwing competition! 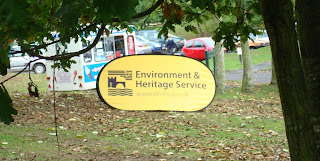 Thank you Environment & Heritage Service (EHS NI)! 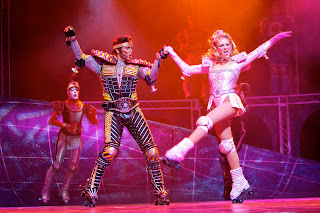 Driving into work I noticed a poster site in East Belfast advertising the musical Starlight Express that’s running in the Grand Opera House until 20 October. 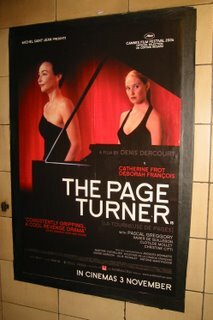 I caught the show just before it closed it’s run in the London West End’s Apollo Theatre back in January 2002. Yikes! Five and a bit years ago. Back in those days, Fi Glover presented (starred in, even) BBC Radio FiveLive’s Sunday Service around 10am each Sunday morning. Perfect listening - once recorded for alter playback - to iron shirts to on a Sunday afternoon or evening. January 2002 was also the time when the Transport Minister Stephen Byers was constantly in the news, the RMT union was on strike on South West Trains, and UK rail fares had just increased by up to 17%. “After all, it’s a classic tale of Steam vs Diesel vs Electric rolling stock ... and it’s now safe to spoil the ending by revealing that the steam train wins out in the end. Maybe the Railtrack bosses should have been sent to a quiet matinée performance along with the train operating company’s management and Stephen Byers to learn about the fine art of making trains run efficiently. While they didn’t run a package about it, Charlie Whelan did read it out! There are still some seats available in Ye Grande Ole Opera House for performances next week. 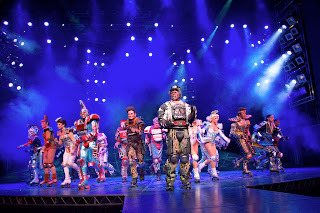 And if the touring show is anything like the London production five years ago, expect to be out of breath watching, and slightly dizzy as the actors trains roll around the stage. 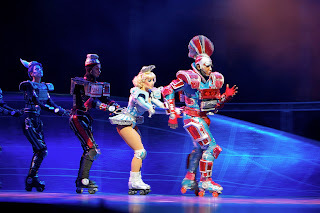 And although they may not be able to whizz up past the front of the circle like the original permanent theatre version, it should still be worth a watch.